Australian dollar can't recover alongside equities after RBA's dovish switch. NAB's Business Confidence and Business Conditions up next. The AUD/USD pair fell to its lowest in over a month, heading into the Asian opening trading around the 0.7060 price zone. Far from its yearly low, as the pair touched 0.6775 during the flash crash suffered early January, the Aussie entered a selling spiral after the sudden change of course of Governor Lowe last week, saying that chances of a rate cut are equal to those of a rate hike, followed by an RBA's downgrade of economic projections for this year and the next. Despite the solid performance of equities, the commodity-related currency remained unattractive, another sign that bears are determined to push it lower. Australia will release December Home Loans this Tuesday, foreseen declining by 2.0% after a 0.9% slide in the previous month, alongside Investment Lending for Homes, also expected to be negative. Both numbers are relevant as Governor's Lowe flip to neutral came amid concerns about the local housing sector. The country will also release NAB's Business Confidence, and NAB's Business Conditions for January. China will offer some minor releases with more relevant figures scheduled for later this week. 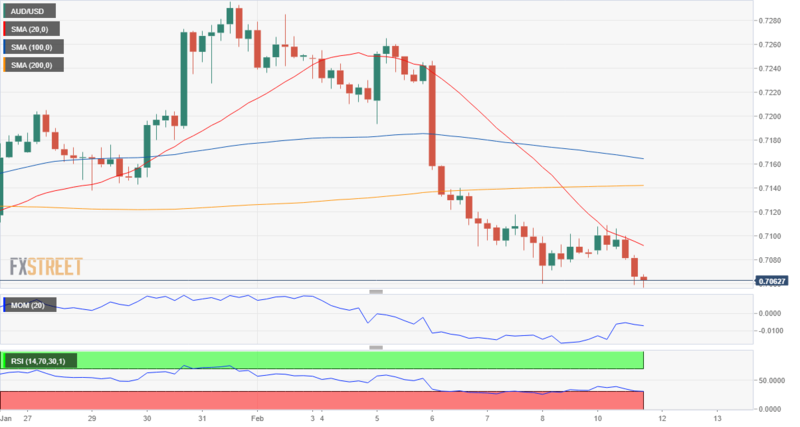 The pair is technically bearish according to intraday readings, as, in the 4 hours chart, an attempt to regain the upside was contained by selling interest around a firmly bearish 20 SMA, currently at 0.7090, while technical indicators flirted with their midlines before turning south, now at daily lows and with the RSI in oversold levels. The pair has its next support in the 0.7020/30 price zone, with a break below it resulting in a steeper decline toward 0.6940.